If you are struggling with pain on the side of the hip, our Osteopaths we can assist you using evidence based rehabilitation and education along with hands on manual therapy. Greater trochanteric pain syndrome (GTPS) is new general term used to describe pain on the lateral hip. The greater trochanter is the bony prominence on the lateral side of the leg bone, near the hip. If you are struggling with pain in this area we can assist you using evidence based rehabilitation and education along with hands on manual therapy. GTPS is a combination of gluteal tendinopathy and bursal irritation. Research has shown us that bursal irritation is almost always a secondary finding due to a gluteus minimus or medius tendon issue. The likely cause of GTPS is by repetitive friction between the greater trochanter and Iliotibial band (ITB), this causes ongoing compression/microtrauma to the gluteal tendons where they insert onto the greater trochanter. This can develop into gluteal tendinopathy – degeneration and disorganization of the area. This leads to weakened gluteal muscles, de-stabilizing the hip and creating local pain and inflammation (bursal irritation). Pain when sleeping on the affected side, walking up hills or stairs. You may struggle to stand on one leg, ie to put pants on. Take home modifications to your daily living are just as important as any hands on treatment. So we will chat through them with you…see below for some easy tips. We will perform manual therapy techniques such as soft tissue and joint release. This may help reduce muscle tension around the gluteal muscles, lower back, thigh, groin and knee to help decrease pain and improve range of movement. Techniques to help promote blood and lymphatic flow, helping reduce pain and inflammation. Our osteopaths will create a management plan, including strength base exercises to help reduce the compression through the lateral hip. So my ITB is tight, Should I foam roll it? Short answer, no. The ITB isn’t a muscle, it is the longest tendon in the body, so we can’t change the length of it. As we mentioned above, most of the pain experienced with GTPS is from compression. So we want to minimise any compression and direct pressure on the area including repeated pressure from a foam roller. So what do we do? The tensor fasciae latae (TFL) is a small muscle on the side of the hip that runs directly into the ITB. 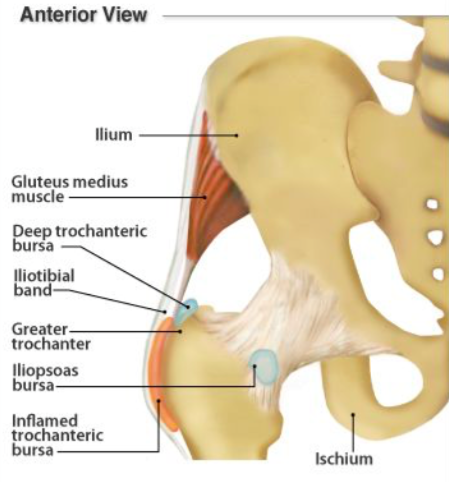 It along with the gluteal muscles play are large part in the the tension of the ITB. Releasing these muscles may have a great effect on the ITB. Sleeping tips: Avoid laying directly on that side, sleep with a pillow in between your knees.